We did this a couple of years ago at the summer art camp, so I felt like it was a good time to revisit the project. Last year, during the holidays, I introduced the (then) 6th/7th graders to Blue Dog. They really loved the vibrancy of Rodrigue’s paintings. The challenge for my students was to add a hat, mittens, scarf, or some sort of wintery look, and then add a crazy background. They a lot of fun with this! Then, we went through a slideshow of Blue Dogs to really pick apart the paintings. In an effort to get caught up, I’m posting three different projects for this one. Whew! The first set is from my (last year’s) 3rd/4th graders: Jellyfish. First, they drew out their jellyfish very lightly, and then covered it in glue. While the glue was still wet, they dripped watercolors and let it bleed. Once the glue was dry, they added the watercolor background and used saran wrap to make it fractal. This one didn’t have the same effect in the background, because the color was too muted. Lesson learned by this little artist! This next set was created by my (then) 5th/6th graders. We were practicing analogous colors. The final set is from my (then) 7th/8th graders. The challenge was to have at least one partially behind another, and at least one partially off the page. I found some free coloring pages and printed them off for the kids to use and swap out. They were able to trace whichever fishes they liked. Then, they used oil pastels to make the fishes hyper-colorful. Finally, they used watercolor to fill in any remaining fish parts as well as the background water. The kids love tangles, and when combined with their names, they really had a good time. These turned out pretty well! I got the original idea from here. I try to do at east one sculpture during the year with each class. Sometimes it’s plaster; sometimes it’s wire, and sometimes it’s paper mache. This was the year of paper mache for sure! As the kids get older, they enjoy challenges, so I try to make each year a little harder than the last. 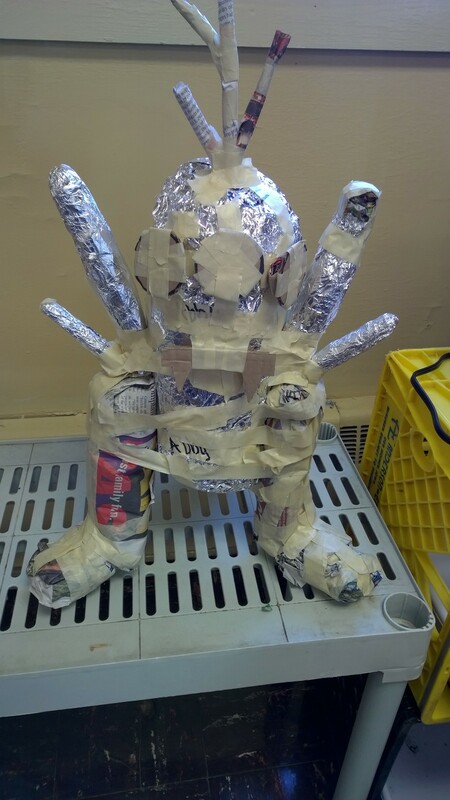 For my 7th/8th grade class, the challenge was to make a monster that was 2 feet tall, and could stand without support. 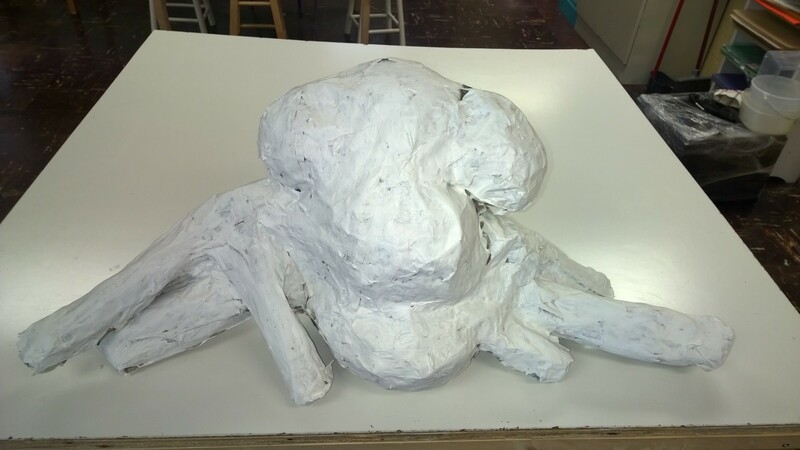 The first thing was to start building the parts of the monster out of nothing but newspaper, masking tape and foil. This also lent a challenge to the students. Once the monster parts were built, they were put together and adjusted to be able to stand up. Some designs only had two legs starting out, but quickly went to three legs or two legs and a tail to keep the balance. 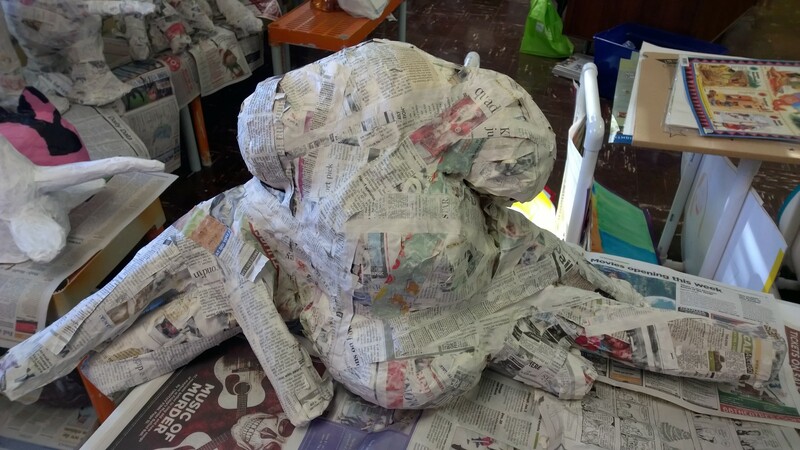 After the monsters were assembled and structurally sound, the students added 3 layers of paper mache. Some of the kids are finally at age where they’re really paying attention to the smoothness of the final product, and they think about this as they go. It’s good to see them want to be proud of their work! Some monsters were significantly bigger than others, so when the students with smaller monsters got finished, they helped out with the larger ones. Teamwork! Once the three layers were applied and dried, the next step was to add the primer. I make my own using glue and white acrylic paint. Grid drawings are a fun way to challenge even my artistically-minded students. It forces them to think linearly instead of just drawing whatever they think of. For the ones who automatically think linearly, they get a chance to really shine because this project, if done correctly, yields beautiful results! It makes everyone look like a pro! I found these pre-gridded super heroes, which made this project 100% easier than coming up with the examples myself! Once the students picked out their favorite superhero, they drew a grid with 1″ spaces. They didn’t draw the super heroes out in pencil first – this was straight-up Sharpie! Once they were done, they erased the grid, and viola!